During the year that I lived in Amravati, India. I must’ve had 30 or 40 slightly different varieties of Sindhi Bhindi Masala. 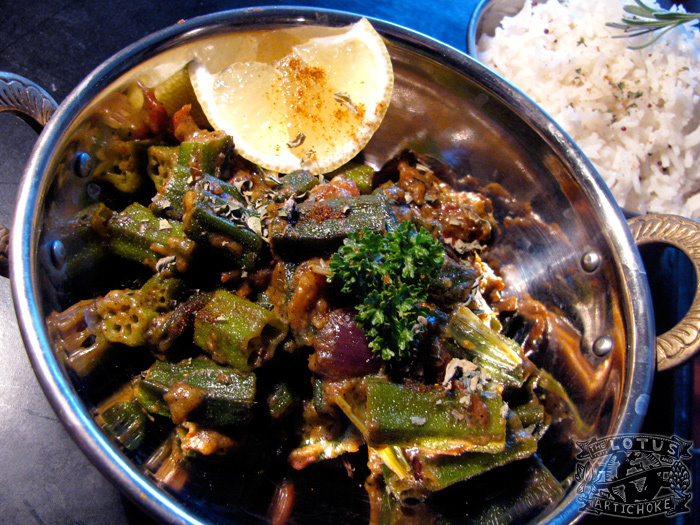 Usually just referred to as Bhindi (Hindi word for okra), this spicy okra dish is North Indian in origin. The kind I learned to make in Indian kitchens is a typical, traditional Punjabi and Sindhi vegetable dish. Bhindi Masala is a regular feature at family lunches and dinners, and was in my lunch tiffin more often than not. Every restaurant cook, every mother, every sister, every grandmother, and every hobby-cook son cooks their okra a little different than the next. Sometimes in curry sauce, usually without. Some were still a bit crunchy, some melted in my mouth. Often they were intentionally burnt and bathing in oil, others were so spicy my lips went numb and my nose started to run away. As a guest at homes and in restaurants, I usually ate this with chapati bread — along with everyone else. At home I usually make it with rice. That’s partly because I love rice, and partly because I’m just not really Mr. Chapati Master. Okra is far more famous and popular in India than in most of the western world. Learning to cook it properly is essential for good, tasty results. It’s one of those somewhat difficult, often distrusted vegetables like eggplant (aubergine). People tend to have strong opinions about okra: it’s distinctive taste and texture. But really, so much depends on good cooking and some shared kitchen wisdom! Removing the ends makes a big difference in the (otherwise, uh, weird) texture of the cooked okra. Adding water only after a few minutes of frying is another trick. Test your okra after 15 minutes of cooking. Experiment with cooking them longer. See what you like. Do what you like. This recipe for Bhindi Masala is my own, with lots of inspiration and suggestion. I’ve tasted dozens of Indian okra dishes. This one is moderately spicy (that is, not insanely spicy), fairly simple (many Indian dishes use up to 10 or even 20 spices), and has that Sindhi curry spin of thickening up the sauce with some chickpea flour. More secrets! Rinse, dry okra well. Cut and discard ends and tips (about 1/2 in / 1 cm each side). Slice okra into 2-3 cm long pieces. Heat oil in a medium pot or sauce pan on medium. Add mustard seeds. After seeds start to pop (about 30 sec), add chili, cumin, coriander, garlic, onion, turmeric, hing. Stir lightly and fry 2-3 min. Add okra and tomato. Stir regularly, cook for 5 min. Add small amount of oil or water and reduce heat if needed. Add 1/4 cup water + chickpea flour, salt. Stir frequently, cook partially covered for 10-15 minutes until okra are well-cooked, partly covered with thick spicy sauce, liquid is gone. Serve with lemon slices and chapati or basmati rice. Bhindi Masala is easily made without garlic and onions: Use slightly more asafoetida and curry leaves if desired. More color: Add chopped red, yellow, or green pepper along with tomato. More sauce: use 2 tomatoes and 1/2 cup water. This entry was posted in North Indian and tagged bhindi, north indian, okra, recipe, sindhi, spicy, vegan. Bookmark the permalink. This is delicious!!! This is one of my favorite Indisn dishes, and this will be my go to recipe. Wish I had made a double batch tonight! Your palak tofu-paneer is another of my new faves. Looking forward to trying more of your recipes!!! Thank you for sharing!!! !